The Beyer family have been wine-growers in Eguisheim, the cradle of the Alsace wine-producing region, since 1580. In 1867, Emile BEYER founded the "Maison de Vin d'Alsace" (the Alsace wine house, currently run by Léon BEYER, who took over the reins from his father Léon BEYER senior in 1959, and his son Marc. Léon BEYER offers its clientele a complete selection of Alsace wines, from Sylvaner and Pinot Blanc to the prestigious Riesling, Tokay, Pinot Gris and Gewurztraminer. These wines are presented under a world-renowned label and include special selections, such as the Riesling "Les Ecaillers", the Rieslings, Pinot Gris and Gewurztraminer "Comtes d'Eguisheim" and even the rare "Vendanges Tardives" and exceptional "Selections de Grains Nobles". Grapes cultivated on the best slopes of Eguisheim and the surrounding area are the raw material from which are made the prestigious Alsace wines which have forged the worldwide reputation and brand image of Léon BEYER wines, present on the wine menus of the finest restaurant in France, Europe and even the world. Some of the best local wine-growers renowned for the quality of their production, loyal to Léon BEYER also supply the grapes from their harvests. The firm presses the grapes, vinifies then ages the wine in the finest conditions. Vinification, done with loving care and attention, combining the rigours of time-honoured tradition and modern techniques, creates a wine for an elite clientele and connoisseurs of great Alsace dry white wines, spirited and elegant, or mellow and sweet, like the Vendanges Tardives or Selections de Grains Nobles. Approximately 75% of the production of these great, upmarket, Alsace wines, are exported throughout the world and appreciated by some of the most discerning amateurs of great Alsace white wines, in the colours of Alsace, the tradition and prestige of Léon BEYER. This is how Hugh Johnson, the great British specialist, presents Léon BEYER wine : "The BEYER wines were the most masculin : firm, broad, dry, substantial and I suppose, in a way traditional in style". Wines, the quality of which is known the world over, present on the wine lists of practically all 3*** restaurants and most of the world's finest tables! Léon BEYER, with the soul of an Epicurean and a passion for gastronomy has travelled throughout France, Europe, and the world, visiting the finest restaurants and prestigious tables. Famous chefs, all of whom have become friends, know him as a great Alsace connoisseur of French gastronomy. Simon ARBELLOT, famous gourmet editor, founder of the Guide Kléber-Colombes, had already mentioned his penchant for gastronomy in 1960 : "Éguisheim is in the holiday mood and the corks of bottles of Riesling, Sylvaner and Gewurztraminer are popping, in honour of the young mayor and great Alsace vigneron, our friend Léon BEYER, whose name is involved in all gourmet events in Paris, France and the world. It is impossible to imagine a Prosper Montagné dinner, a "Les Ecaillers" competition, a tasting of shellfish, a marriage of sea and garden, without the presence on the table of these tall, long-necked bottles, bearing the prestigious names of the Alsace vineyard. With a host of honorary titles and nominations, Léon BEYER is proud to be a representative of Alsace throughout the world. His son, Marc BEYER, appreciates and cultivates the same values. It was Mark who was officially entrusted by Colmarian BARTHOLDI in NEW YORK, with organising all of the centennial Statue of Liberty gourmet events, the most important French gourmet event ever organised by Alsace in the United States. Founder-member and member of the Bureau de l'Association Amicale "Saveurs de France", he has also been the President of the Festival International de la Gastronomie de Colmar (Colmar International Gastronomy festival), since 1996. 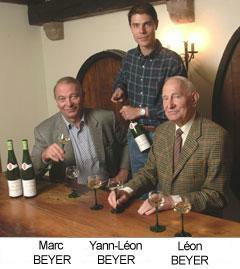 "produce good wine and spread the word, gastronomy and Alsace wine, prestige and long life of Léon BEYER wines"